Beef – Pork – Poultry – Fish and Seafood – Baked Goods? Great cooks use a cooking thermometer as their guide – NOT a clock. A cooking or meat thermometer should not be a sometime thing. A cooking thermometer can be used for all foods, not just meat. It measures the internal temperature of your cooked meat, poultry, seafood, breads, baked goods, and/or casseroles to assure that a safe temperature has been reached and that harmful bacteria (like certain strains of Salmonella and E. Coli O 157:H7) has been destroyed. Foods are properly cooked only when they are heated at a high enough temperature to kill harmful bacteria that cause food-borne illness. Use it every time you prepare foods like beef, pork, poultry, roasts, hams, casseroles, meat loaves, egg dishes, and even your baked goods. If you don’t regularly use a thermometer, you should get into the habit of using one. According to the U.S. Department of Agriculture, internal temperature is the only way to gauge whether food is sufficiently cooked. USDA research reveals that the “color test” can give consumers misleading information about the safety of the foods they are preparing, since cooked color varies considerably. For example, freezing and thawing may influence a meat’s tendency to brown prematurely. The following Internal Temperature Cooking Charts are a work in progress. 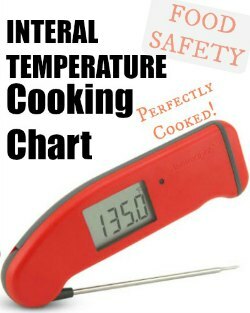 I have been researching and testing recipes for many years to come up with the perfect cooking and baking internal temperatures. Remember – Great cooks use a cooking thermometer as their guide – not a clock. I welcome any help, suggestions, and advice that you could contribute on internal cooking temperatures. Please e-mail me (just click on the underlined): Linda Stradley. Thank you in advance for your help! For roasts of lamb, beef, or veal: place the thermometer midway inside the roast away from bone. Residual Heat or Carry-Over Cooking: Remember, the steak will continue to cook as it sets. The temperature will rise 5 degrees F. to 10 degrees F. internal temperature. So, pay attention to how long you let the cooked meat sit before serving. Carry-over cooking is caused by residual heat transferring from the hotter exterior of the meat to the cooler center. As a general rule, the larger and thicker the cut of meat, and the higher the cooking temperature, the more residual heat will be in the meat, and the more the internal temperature will rise during resting due to carry-over cooking. This means the meat must be removed from the heat at an internal temperature lower than your desired final internal temperature, allowing the residual heat to finish the cooking. 74 to 79 degrees C If the meat pulls apart easily, the brisket is ready to serve. 82 degrees C If the meat pulls apart easily, the pot roast is ready to serve. Also called fork tender. 71 to 74 degrees C For hamburger patties, insert the digital food thermometer through the side of the patty, all the way to the middle . Place the thermometer at the innermost portion of thigh and wing, and in the thickest part of the breast, checking the temperature at each of these locations. Remember that the chicken will continue to cook after it’s removed from the heat and the internal temperature will rise about 5 to 10 degrees F. in the first few minutes it’s off the heat. 160 to 165 degrees F.
71 to 74 degrees C.
Dark meat 160 to 165 degrees F.
Breast meat 160 to 165 degrees F.
Thighs, Wings, and Legs 160 to 165 degrees F.
Deep Fried or Cajun Fried Turkey 165 degrees F.
76 degrees C. Juices run clear and leg moves easily. (Chicken and Turkey) 160 to 165 degrees F.
71 to 74 degrees C. For patties, insert the digital food thermometer through the side of the patty, all the way to the middle. (cooked alone or in turkey) 165 degrees F.
74 degrees C. For the stuffing inside of a turkey, duck, or chicken: place the thermometer to the center of the stuffing. Place the thermometer midway inside the roast away from bone. Remember that the pork will continue to cook after it’s removed from the heat and the internal temperature will rise about 5 to 10 degrees F. in the first few minutes it’s off the heat. Medium 140 to 145 degrees F.
180 to 200 degrees F.
82 to 93 degrees C.
195 to 200 degrees F.
90 to 93 degrees C.
Raw Sausage 160 degrees F.
Sausage (pre-cooked) 140 degrees F.
Raw Ham 160 degrees F.
Pre-cooked Ham 140 degrees F.
Salmon 130 to 135 degrees F.
54 to 57 degrees C. Salmon has almost do collagen. This means it will start to lose moisture more quickly than beef. Halibut -Cod- Red Snapper- Sea Bass-Tilapia 130 to 135 degrees F.
54 to 57 degrees C.
Trout 135 to 140 degrees F.
57 to 60 degrees C.
Tuna - Swordfish - Marlin 125 degrees F.
Ahi Tuna (Sashimi grade) 115 to 120 degrees F.
46 to 49 degrees C. Ahi Tuna is most often served rare or seared rare. This is because the longer you cook it, the more flavor and moisture it loses. Sashimi grade tuna has been flash frozen to kill any parasites. 49 degrees C. Cook until medium-rare and the shrimp just start to turn pink (do not overcook or the shrimp will become dry and lose its flavor). 62 degrees C. Place thermometer in the tail to check the internal temperature. Lobster requires a high temperature than other fish since its muscle fibers are longer and require more heat to shrink. Boiled or Steamed, whole Lobster 145 degrees F.
Grilled Lobster 145 degrees F.
Baked, Grilled or Broiled Lobster Tail - each 140 degrees F.
60 degrees C. Shell cut - piggyback lobster tail (lobster meat is exposed). 49 degrees C. Sear, bake, or broil each side for approximately 4 minutes or until an instant-read cooking or meat thermometerinserted into their centers reach 115 degrees F. Remove from heat. The carryover cooking will add another 10 to 15 degrees, for an ideal final temperature of 125 to 130 degrees F. They should also have lost their translucence and turn opaque. Clams - Mussels - Oysters Cook clams, mussels, and oysters until their shells just open. Throw away the ones that do not open. Crab Cakes 150 to 155 degrees F.
65 to 68 degrees C.
Insert the thermometer from the side of the bread. If the bread is in a loaf pan, insert it just above the edge of the pan directing it at a downward angle. Quick Breads (Breads, Muffins and Cornbread) 200 degrees F.
Yeast Breads 200 to 210 degrees F.
93 to 99 degrees C.
Soft Breads/Dinner Rolls 180 to 190 degrees F.
82 to 88 degrees C.
Sourdough BreadsSourdough Breads 200 to 210 degrees F.
Cinnamon Rolls 190 to 200 degrees F.
87 to 93 degrees C.
Water temperature to add yeast 105 to 115 degrees F.
41 to 46 degrees C.
205 to 209 degrees F.
93 to 98 degrees C. Insert thermometer in the center of the cake. Carrot Cake 205 to 209 degrees F.
93 to 98 degrees C. Remember: The cooking process continues even after you remove the cake out of the oven. As the cake cools, the residual heat on the surface slowly penetrates to the middle. Clafouti (with fruit) 160 degrees F.
Devil's Food Cake - Red Velvet Cake 205 degrees F.
Molton Chocolate Cakes 160 degrees F.
Pound Cake 210 to 212 degrees F.
99 to 100 degrees C.
Tres Leches Cake, Three-Milk Cake 200 degrees F.
88 to 93 degrees C.
Cheesecake When the internal temperature of a cheesecake rises beyond 160 degrees F. (71 degrees C.) while baking, it will always crack. To prevent this from happening, Take it out of the oven when the cheesecake reaches 150 degrees F. (65 degrees C.) at the center to avoid over baking. Insert thermometer a couple inches in from the edge of the pie. Chocolate Cream Pie 165 degrees F.
Custard Pie - Cream Pies 170 to 175 degrees F.
76 to 79 degrees C. Bake until the custard has set around edges but jiggles slightly in the center when tapped on the side with a wooden spoon. Fruit Pies (Blueberry, Blackberry, etc.) 175 degrees F.
79 degrees C. Fruit pies should be juicy and bubbling all over, especially in its center. The pie needs to bubble if it contains a starch thickener, otherwise the starch is not going to thicken. Pecan Pie 200 degrees F.
Pumpkin Pie 175 degrees F.
Sweet Potato Pie 175 degrees F.
Meringue Pies 160 to 165 degrees F.
Insert thermometer in the centers. Begin checking temperature about 5 minutes before recommended time. Bread Pudding 160 degrees F.
Creme Brulee 170 to 175 degrees F.
76 to 79 degrees C.
Flan 170 to 175 degrees F.
When using a temperatures specified below are for sea level. At higher altitudes, subtract 1° F from every listed temperature for each 500 feet above sea level. Thread Stage 230 to 235 degrees F.
110 to 112 degrees C.
A spoonful of sugar drizzled over a plate forms a fine, thin thread. This stage makes a syrup, not a candy. Soft-ball Stage 235 to 240 degrees F.
112 to 116 degrees C.
When a small amount of sugar syrup is dropped into very cold water, it forms a ball that does not hold its shape when pressed with your fingers. Firm-ball Stage 244 to 248 degrees F.
118 to 120 degrees C.
When a small amount of sugar syrup is dropped into very cold water, it forms a ball that holds its shape, but it still sticky, when pressed with your fingers. Hard-ball Stage 250 to 266 degrees F.
121 to 130 degrees C.
When a small amount of sugar syrup is dropped into very cold water, it forms a ball that holds its shape but is pliable. Soft-crack Stage 270 to 290 degrees F.
132 to 143 degrees C.
When a small amount of sugar syrup is dropped into very cold water, it scan be stretched between your fingers and separates into hard but not brittle threads. Hard-crack Stage 300 to 310 degrees F.
149 to 154 degrees C.
When a small amount of sugar syrup is dropped into very cold water, it will solidify but will separates into hard brittle threads. Light Caramel Stage 320 to 335 degrees F.
160 to 170 degrees C.
Poured onto a white plate the syrup will be honey-golden in color. Dark Caramel Stage Up to 350 degrees F.
Watch carefully as any temperature above 350 degrees F. begins to burn the sugar and it will develop a bitter, burnt taste. 98 to 100 degrees C. Potatoes are done if tender when pierced with a fork and the internal temperature reached. Boiled Whole Potato 200 degrees F.
Check out my articles on How To Boil Water – Boiling Points of Water and Poaching vs. Simmering vs. Boiling. Tepid Water 85 to 105 degrees F.
29 to 40 degrees C. Water is comparable to the temperature of the human body. Warm Water 115 to 120 degrees F.
46 to 48 degrees C. Water is touchable but not hot. Hot Water 130 to 135 degrees F.
54 to 57 degrees C. Water too hot too touch. Poach 160 to 180 degrees F.
71 to 82 degrees C. Poaching is “to cook an item by submerging it in a liquid that is just barely simmering.” Poaching is not a rolling boil. Poaching, compared to boiling, is a much gentler technique. Simmer 185 to 200 degrees F.
85 to 93 degrees C. A simmer is sometimes called a “gentle boil.” Small bubbles periodically rise to the surface – the gentler and slower the bubbles, the lower the temperature. Low Simmer 180 degrees F.
Slow Boil 205 degrees F.
96 degrees C. There is more movement and noticeably larger bubbles than simmering. Rolling Boil 212 degrees F.
100 degrees C. The water is rolling, bubbling, and steaming. High Altitude: Each 500 foot increase in altitude will cause a drop of approximately one (1) degree in the boiling point. 165 to 175 degrees F.
74 to 79 degrees C. Insert thermometer in the center. Some times the 165 degrees F. temperature only warms the casserole, and may not be not enough for you. Then continue until 175 degrees F. is reached. Hollandaise Sauce 160 degrees F.
150 degrees F. As raw eggs carries a risk of salmonella infection. Heat the sauce to 160 degrees F. on your digital thermometer to kill bacteria. 71 degrees C. When eggs are part of the recipe it is necessary that the internal temperature of the baking item reach at least 160 degrees F. (71 degrees C.) in order to kill any dangerous bacteria.